The summer time can be so rough, not only keeping the kids busy and happy, but making sure they don't lose everything that they learned in school the year before. No one wants to sit down and do formal schooling so we try to think of fun ways to learn. Recently I was given the chance to review a great science toy from SmartLab Toys. The Extreme Secret Formula Lab has brought us no only hours of fun over the last week but encouraged my children to use their minds. Everyone ready to do their part! Pouring in the first ingredient! We have our rock candy making and plan on making a new experiment today! With over 20 different things to try we will have a summers full of fun, but today it is glow in the dark alien blood hehe. What a fun opportunity this has been. I can't wait to check out some more of their products. My oldest has already requested a few for his birthday. 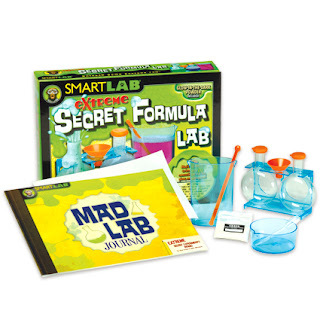 SmartLabs has great FREE download-able activities for kids! Check it out at http://www.smartlabtoys.com/free-zone.html .You can find great things like word searches, trivia and even face masks. If you would like to own this product or check out any of their other great products you can do so HERE. What is great is here's a special deal for my readers: Save 25% by entering BLOGDEAL0812 at checkout! (code expires August 31, 2012).The people at SmartLab Toys have be gracious enough to offer this great kit($19.99 value) to one of my readers as well! So make sure you take the time to enter on the rafflecopter below. It is fast and easy, plus you can't win if you don't enter ;o) Good Luck! cupcake decorating studio!!! :) awesome! I love the Wallscapes Flower Garden. I like the cupcake decorating studio. Something my daughter and I can do together. Glow-in-the-Dark Lab- That is the one I think my son would like best...he is very into experiments and making things...I think he would just love that. My kids would love the bug playground. I would love to not find bugs smuggled into our house in shoe boxes for a surprise later. I love this! Such cute toys- my kids would LOVE this! I like the Weird & Wacky Contraption Lab. Thanks. Love the sprout house and the bug playground. I might need to get some of these for the girls. I love kits like this! My nephew will LOVE Car design Studio! My kids would go crazy over this. Gr8 review! !